Weaning starts when babies turn 6 months old. Weaning means to initiate solid food and slowly gradually withdrawing the supply of mother’s breast milk. Always start with strained fruits, vegetables and fruits. Weaning Babies above 6 months of age can eat soft mashed foods like Rice Mash, Bulgur Wheat Porridge, Banana Mash and vegetable purees like Cauliflower and Broccoli Puree. Do not give foods such as cow’s milk, eggs, honey till they are at least 1 year old because they are indigestible to babies. Such ingredients can also cause allergic reactions. It is always better to introduce single food at a time as you will be able to monitor for any reactions like rashes, diarrhea or vomiting. If your baby doesn’t like the taste of the new food then wait for a few days and try refeeding the same food because babies tastes changes from one day to another. Try introducing cups and sippers to your baby but only use them for drinking water and not juice because this can lead to drinking large quantities of sugary drinks. By 7 months, your baby is ready for liquids like soup too. Initially, take care to introduce one vegetable at a time, in the soup form, so that it is easier to digest and your baby will also get used to various tastes. Moreover, when you make a multi-ingredient recipe and it is rejected by your child, you will not know which ingredient was unsuitable. So start with Beetroot Soup, followed by Carrot Soup. Once your infant gets used to both these veggies individually, you can combine them to make Beetroot and Carrot Soup. The energy requirements increases as the baby grows and it becomes really important to feed calorie dense foods i.e. foods which give more calories even in small quantities. Nuts like peanuts, walnuts and almonds, dried apricots and figs, paneer, curd, ghee etc. Walnuts and Paneer Puree is a great calorie dense and body-building food. Oats-and-Apple-Porridge is a wholesome porridge where milk is a good source of calcium, which is extremely important for the development of your baby's bones and teeth and oats are high in energy, protein and fibre. Feeding Vegetable Khichdi is a good way of introducing your baby to a mildly-spiced dish. Dal mash is a wonderful supplementary food that helps meet your infant’s increased energy and protein demands at the growing and active age of 8-9 months. By this age your baby is also able to eat finely chopped fruits and vegetables. Once your baby is 11 months old she would definitely have some teeth and can now chew on some teething foods. Encourage your baby to have whole fruits and vegetables like banana, chickoo, apples and cucumber, which are soothing for the gums. Chewing food is also great exercise for your baby’s gums when they are teething and helps to strengthen the new teeth that are emerging. Peel and cut the foods into bite-sized pieces. Fruits and vegetables provide bulk in the diet and aid in the baby's bowel movements too. But always keep a watch on them to avoid choking. Let your baby nibble on this crispy Till Chikki in between meal times to soothe their gums. These Whole Wheat Date Cookies are healthier than others as it is made up of whole wheat flour and date purée which is used to sweeten these cookies provides iron and fibre. Serve these yummy Vegetable Parathas for breakfast, at the start of your baby’s busy day, or during lunch time when she takes a break from ‘play’. Corn-Sambhar is an innovative variant of sambhar, this is very different from the traditional recipe but very attractive to children. 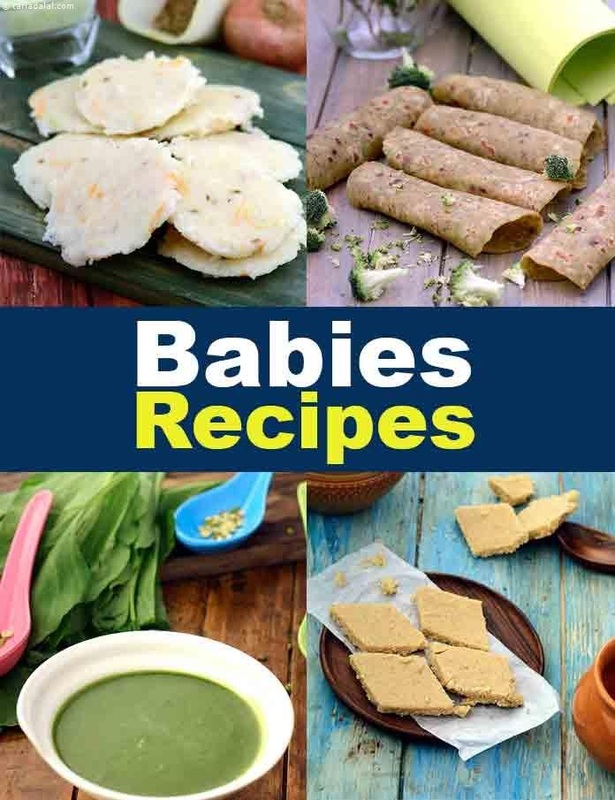 An interesting way to incorporate a variety of flours to your baby’s diet is by making Jowar and Bajra Vegetable Roti as this recipe introduces your baby to new textures and flavours, and provides ample of nutrients too. Babies above 12 months of age are called as Toddlers. Most of the teeth have erupted and they can eat almost everything that an adult eats. Mini Mixed Moong Dal Chila is a perfect example that children are capable of eating the same dishes that adults eat. Cheesy Corn and Vegetable Cutlets are mouth- watering cutlets which your kid would definitely not want to miss on, apart from being tasty they are loaded with protein calcium and vitamin A. A fast-growing baby needs super-foods like Sprouts-Khichdi to keep her charged! Moong Sprouts Dosa has good quality protein as it contains a combination of cereal and pulse and also gives significant amounts of fibre and vitamin A. Enjoy our collection of Baby Recipes and other baby recipes articles below.